It's easy. It's FREE. You are in control and you only pay for performance. 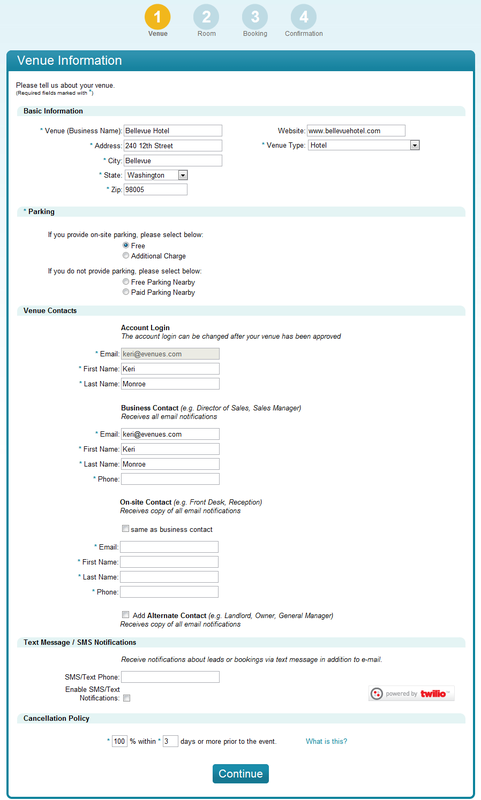 You'll receive pre-qualified leads from eVenues via email. You still have the option of accepting or rejecting any prospective renters. You can up-sell and cross-sell add-on services. You can continue using your in-house reservation system and personnel. Large venues where in-house food and/or catering packages that need to be negotiated; professional venues that offer ad-on services. YOU pay a 10% commission: to eVenues for each confirmed booking of your rental space(s). Most complete, professional profile listing for your meeting space on the web. Optimized for Google and Bing searches. Profiles include: map, Google streetview, up to 10 photos, either fixed or fixed pricing, configurations, A/V, catering, reviews/ratings, amenities, and an automatic leads referral engine. eVenues offers the most flexible and automated system for handling room lead handling. 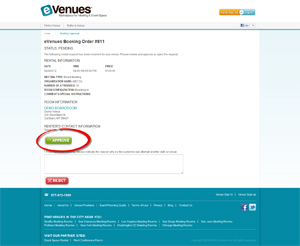 eVenues gives venues the control to accept and reject lead inquires, plus see all the customer and event details all in a simple Banquet Event Order (BEO) format. eVenues has designed the first mini-RFP and uses this to qualify the business before routing it to the venue, saving time and energy. eVenues sends venues an invoice upon successfull meeting/event date. 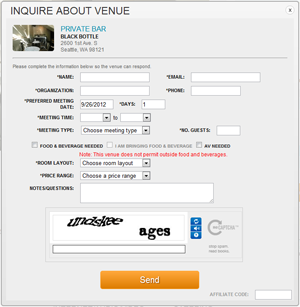 Venues can track the statu by logging into their customer dashboard. Inside the eVenues console, there is a transaction history that shows all transactions and your net payout. eVenues offers the most flexible and complete registration for listing your meeting space. The first step gathers information about your venue business, followed by details and amenties for your room space, ending with setting up your room availability (optional). 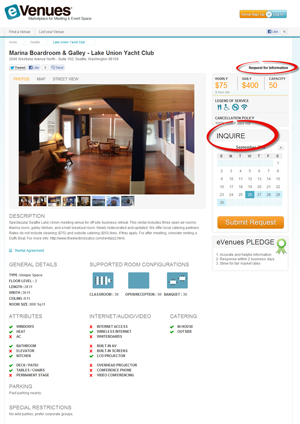 eVenues typically will approve and publishing your listing live within 2 hours.